with dalits, the dalit movement and the horrors of untouchability. She was a participant in the radical Dalit Panther movement of 1974; and in the 3-month long Worli clashes with the Shiv Sena. Her sensitive nature drew her to the agony of dalit oppression and led her to seek answers to it. She read voraciously and gained a deep knowledge of Marxism. Later, in the post-Emergency period she became one the leading figures in the country in the civil liberties movement and was one of the initiators of the CPDR (Committee of Protection of Democratic Rights). In 1982 she moved from Mumbai to Nagpur and while teaching at Nagpur University she actively participated in, and played a leading role in the trade union and dalit movements in the region. In the process she went a number of times to jail. With State repression increasing she was forced to go underground. Later, at the call of the Party she went to Bastar to work among the tribals, and on returning she took up the responsibility once again of building the revolutionary movement in Maharashtra. Since the last 15 years she has been working in the underground building the Party and Maharashtra as well as leading the women’s wing of the Party, until her sudden and untimely demise. Court. With the father a Kannadiga and mother a Gujarati and with all the aunts (from the mother’s side) at one time in the CPI (an uncle from Aurangabad was till his death a top leader of the CPI) she was brought up in a non-religious, liberal atmosphere from childhood itself. An atmosphere of serious reading, intellectual creativity, and rational thinking, and a pro-poor attitude, was very much part of her entire upbringing. In this atmosphere she excelled academically in both school and college. in 1971. Reading the accounts of the Chinese revolution and the GPCR by western authors inspired Anu and many of that generation. The purity of the self-sacrificing nature of the first generation naxalites, many of whom were killed in the prime of their youth, further acted as inspiration. she had taken up before going to the hospital. Ofcourse, that morning there was no indication whatsoever that she would never return. But, within hours her internal organs began failing and then she was no more. dalit issues and caste oppression, she could stand her ground, with widespread support from the youth. poet of the region. The Marathi translation of the poems sold extensively in all Maharashtra, creating a major impact. Among the many fields she worked, her most effective impact was taking revolutionary politics amongst the dalits and arousing them to a revolutionary consciousness.She was one of the most prominent leaders f the civil liberties movement in the post Emergency period and played a prominent role in the famous Civil Liberties Conference held in 1977 at Delhi, demanding the release of political prisoners. The conference included such leading lights as V.M.Tarkunde, Govinda Mukhoty, Subba Rao, Sudesh Vaid and even some ruling class elements as George Fernandez and Arun Shourie. She continued this role through the 1980s inspite of all her other activities. She also played a role in the formation of the AILRC (All India League of Revolutionary Culture) formed in 1983. 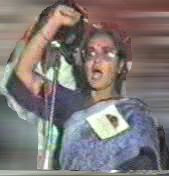 She was one of the main speakers at the Sindri (near Dhanbad) Conference of the AILRC in 1985, together with KVR, Gaddar, VV and others, and till today she is much remembered by the comrades of Bihar and Jharkhand (many in the leadership today) who were attracted to the revolutionary movement by the impact of that Conference and the cultural performances. Many in the region remember her fondly from those days. occasion she had a very narrow escape when the police came within feet of where they were resting. Their firing missed her and the retaliation by her squad allowed them to retreat without any loss of life. in the area. She was there during the peak of the 1997 famine in which hundreds had died of starvation in other areas. Here, with the Party seizing grains from the hoarders and distributing grain the damage was much controlled. During this period, attacks of malaria, the terrible dry heat of summer, coupled with the famine conditions took a toll on her health, when she lost about 10 Kgs of weight. It was only her enormous commitment to the cause of the people, and tremendous will-power that kept her going under even these worst conditions. Besides, her nature was such that she never showed any of her own sufferings. She always bore pain, whether physical or mental, without complaining, or others coming to know. After returning from Bastar she took up Party responsibilities in Mahaashtra while continuing an underground existence. For the last decade she has contributed to building the revolutionary movement in Maharashtra, besides playing the major role in running the Mahilla subcommittee of the Party since 2001.
this Sub-Committee she played an important role of drafting the Women’s Perspective of the Party. At the time of her death she was working on studying the problems women comrades were facing in the Party, the varied forms of patriarchy they face, and devising a rectification plan that would help the growth of women comrades, so that they can grow to take greater leadership responsibilities. In fact her very last task was taking a class of the leading women activists from Jharkhand, mostly from tribal background, to explain the Women’s Perspective of the Party. Her untimely and premature death will have a serious impact on the revolutionary movement in the country and particularly on the development of women’s work in the Party as also the development of work in Maharashtra. one of the most popular leaders of Nagpur and go underground and join the squads in Bastar; even in her very last days when the bulk of the Party leadership was arrested in Maharashtra it was she who held the Party together though it was high risk with the police specifically hunting for her. a true and genuine communist. Her loss is an enormous loss for the revolutionary and democratic movement of the country; and more particularly for its progressive and revolutionary women. and Com. Janaki led the two member team for the first of such field trips to Bihar and Jharkhand in 2002. She had taken classes on the women’s perspective and the team also had in depth discussions on the problems of women comrades and obstacles in their recruitment and retaining them in the party and army with the leadership. The team had written a report on the trip with their observations and suggestions for the CC.The CMSC’s field reports were for the CC to look into these matters. patriarchal society. She unsparingly gave the best of these abilities to solve the problems of women inside the party. She was to lead the CMSC in studying the problems of development of women comrades in the party, army and UF, which the CMSC had taken up recently. It is not just a great loss not to have her guidance in fulfilling the task but all the more painful because she was one of the shining examples of what women could achieve in spite of the patriarchal barriers and was serving as a live model to the women comrades. Bur her life will continue to be a beacon light for generations of youngsters and especially the women joining the revolutionary movement. the Panther movement and later, when it began collapsing and the leaders getting co-opted, began tailing it. In the short span of its existence the Dalit Panther movement brought a radical change in the thinking amongst the SCs of the State and introduced the term Dalits for SCs rather than the hinduised ‘Harijan’ of M,K,Gandhi. It also introduced a radical cultural trend in Marathi literature. Dalit literature, though later co-opted by the state and ruling classes continues to sprout radical views in the bastis and mohallas as also many a rural ghetto in the state. Then, there was not yet any deep understanding on the Dalit question but Anuradha played an active role standing with the dalit masses and against the Shiv Sena and other reactionaries. This was her first involvement on the issue. all activists were hounded and many arrested. Through all this Anuradha became one of the most sought after speakers at any dalit function. The repression had a dampening effect on the activities, yet the populace was awakened to a new alternative path for change. And with each speech more and more dalit forces got attracted to the politics of Naxalbari and the Marxist radical approach to the caste question in India. But, with the growing repression and the State forces particularly beginning to target her, she gave up her university job and went underground. After a stint of three years with the Bastar tribals her last three to four years of her life was again amongst a completely new batch of Ambedkari forces once again winning them over to the politics of Naxalbari. wrote many theoretical and ideological pieces particularly associated with the dalit and women’s question. Besides, she conducted many a polemic on this question with both, those taking a dalit/post-modernist view on the question and with Marxists who took a hostile view. This she wrote in both English and Marathi. As already mentioned it was she who wrote the original draft for the policy paper on the caste question in India by the erstwhile CPI (ML)(PW). This was the first such policy paper by a revolutionary communist party. More recently she wrote a polemical/ analytical piece on bourgeois feminism, bringing out its various manifestations. She was also instrumental in the preparation of the Women’s Perspective of the CPI (Maoist) adopted recently by the Party. of languages being fluent in English, Hindi and Marathi, with a good knowledge of Gujarati and even understood Telugu, Kannada and Gondi. Hey i'm new here, I came accross this chat board I find It very accommodating and its helped me out a great deal. I should be able to contribute and support other people like it has helped me. [url=http://www.squidoo.com/saclongchampa]longchamp soldes[/url] Like dogs, they enjoy being with people. They can only see reasonably well, but they have excellent senses of hearing and smell. Some are cuddly, others more independent; they vary a lot in temperament, just like other pets and humans.. Pre-filled bags are usually filled with soft foam, but other options include bags that can be filled with water, feathers, wood chips or just about Fashionable Women Mulberry Euston Leather Tote Bag Dark Gray,Hot Selling In Our Mulberry Handbags Online Shop. any other type of pliable stuffing. The lighter the filling material, the lighter your bag will be, while solid materials like chips or sand will be heavier. Water bags are usually the heaviest if they are fully filled, while feathers or soft filler produce the lightest bags..
[url=http://longchampsacsa.webklik.nl/page/homepage]sacs longchamps[/url] If you are a highly competitive tennis player, it might be fair to say that tennis is your lifestyle. For those of us whom no one pays to see play, tennis is more likely part of a busy, hectic lifestyle. Either way, modern tennis bags are designed with both types of people in mind, having conveniences Mulberry big sale in our shop, welcome to shop for the Highly Appreciated Mulberry Women's East West Bayswater Printed Leather Shoulder Black Bag at discounted price, a variety of mulberry bags uk sale, all in high quality and reasonable prices. that make playing on the go more convenient..
[url=http://longchampmoinse.blogs.fr/]sac longchamp moins cher[/url] Exhibition supported by the National Development and Reform Commission, Ministry of Science, the Ministry of Commerce, Ministry of Information Industry, China International Trade Promotion Committee, State Administration for Industry, the Customs Department and other departments support and guidance for the success of the show provided a favorable protection. In the future, to continue on the basis of summing up experiences, learn from advanced foreign show concepts to move to a higher level event. One, this show features: 1.. Here we provide some tips that are to be followed while washing your b . It is a method where ink will be used for printing is passed through either a fabric or Original Mulberry Women's Daria Drawstring Leather Tote Red Bag free shipping, Mulberry bagsÂ shop welcomes your purchasing a netted/webbed surface. This is extended into a .. Incredibly user-friendly, the embroidery machine also offers a time-saving memory function that saves designs for future use, plus on-screen help and on-screen editing with its monochrome LCD back-lit touch-screen control panel, which measures 1-3/5 by 3 inches. Other highlights include an easy bobbin-winding system, a Quick Set bobbin, advanced needle-threading, a thread-cutter button, and an automatic upper-thread tension system for perfect stitches on any fabric, as well as a super-bright work area with two LEDs and embroidery rotation in 1-degree, 10-degree, or 90-degree increments. The unit supplies a full array of accessories including a 5-by-7-inch embroidery hoop, an accessory foot, a seam ripper, bobbins, a needle set, a cleaning brush, screw drivers, spool caps, a spool net, scissors, and an accessory bag, plus a dust cover, a user manual, and a handy reference guide..